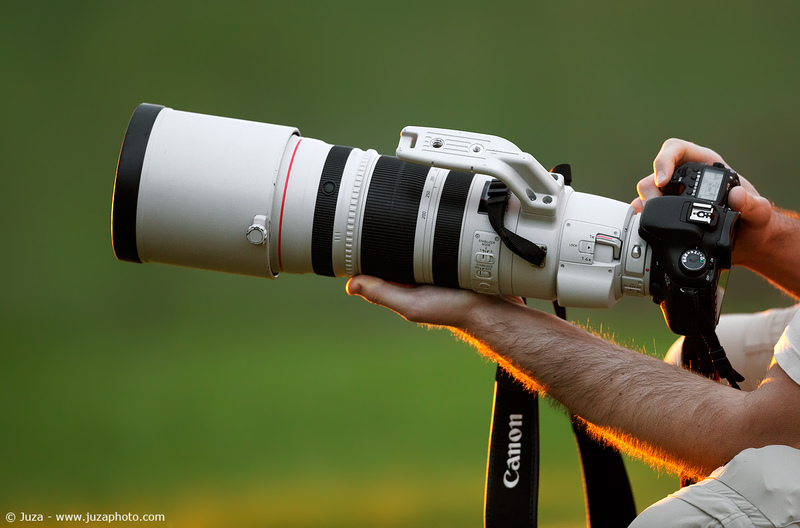 Canon EF 200-400 f/4 Preview, text and photos by Juza. Published on April 23, 2013; 3 replies, 33500 views. The Canon EF 200-400 f/4L IS 1.4x is the first 200-400 f/4 zoom from Canon and it is one of the very few lenses that have an embedded teleconveter. It was announced in 2011, but Canon does long field tests with professional photographers before releasing pro gear, so the 200-400 has taken several years to reach the best in every respect. I have had the possibility to try a pre-production sample in a recent sport event in Italy; I can not publish image samples, but it is interesting to give a closer look to it anyway! The dimensions are similar to the 500 f/4; of course built quality is first rate, as you would expect from a super-pro L telephoto. A common misconception is that this lens is an update of the 100-400: actually, they are completely different lenses; the 100-400 is a way cheaper, smaller and lighter semi-pro lens, while the 200-400 is bigger, brighter and aimed at the top professional market. It is quite heavy! It weights more than 3.6kg, or almost 4 kilograms with the lens hood. Other than that, the look is very similar to the other recent telephotos. On the left side you can find the switches panels. On the largest panel, you can see the stabilization button: the classic mode 1, mode 2 for panning and the new mode 3 that works only during the exposure. The image stabilizer is very effective, as for the other second-generation superteles: sometimes I got sharp photos even at 1/40-1/60, and with shutter speeds of 1/200 or faster the photos are almost always sharp. In comparison with the 600 f/4 and 300 f/2.8 that I have owned in the past, I'd say that it is really possible to see the improvement of the stabilizer, and it it very appreciated! 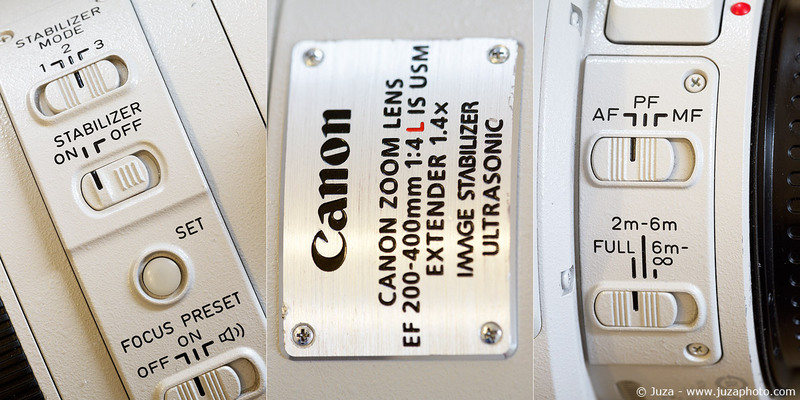 In the smaller panel switch, you can chose between AF or manual focus, plus the Power Focus for video. PF is essentially manual focus done by the AF motor, it help to change smoothly the focus during movies. Note that the focus switch begins from 2 meters - that is really close for a 400mm super telephoto; by comparison, the minimum focusing distance of the 400 f/2.8 IS II is 2.7 meters. What makes the 200-400 so special is, of course, its embedded teleconverter. The advantage is that you can transform the lens in a 280-560mm f/5.6 is a fraction of second, without the risk of losing the action while you mount and remove a teleconverter. Other than that, in dusty environments you don't have to worry about changing teleconverter; one last advantage is that this TC is created 'on purpose' for this specific lens, so the loss of image quality should be minimal. In the next photos, you can see the TC switch and the 'hump' on the side of the lens. This hump host the lens group of the teleconveter. How does it work? if you remove the rear lens cap, you can clearly see the telecoverter being added and removed. When you 'turn off' the TC, you physically move it out of the lens, in the side hump, so you gain one stop of light and you don't make any compromise in image quality. 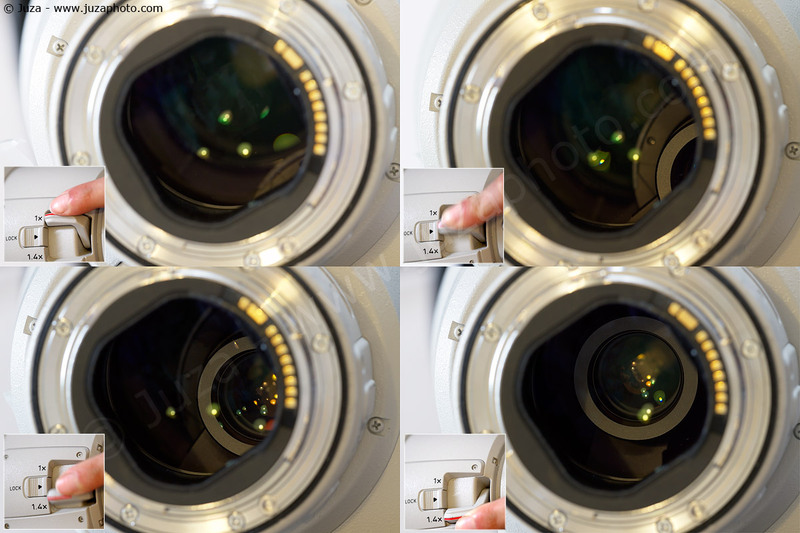 The following sequence shows how the TC lenses moves in while you move the switch. Note that you can lock the TC in the 'on' (1.4x) or 'off' position (1x), but you can not leave it on intermediate positions. Well, actually, even though it is not encouraged by Canon, you can keep it on a intermediate position, if you keep the switch sill with your finger. The result is curious, very artistic: you get a semi-transparent enlarged image above the original photo. Of course you can easily get the same effect with Photoshop, so it does not make much sense, but if you are curios you can try (only in manual focus). The 200-400 is compatible even with 'external' teleconverters, both the 1.4x TC and the 2.0x TC; the performance of AF and the image quality of the various combinations will be the subject of another article that I'm going to publish when the final version of the lens is available. A lens like that has its pros and cons. Its zoom range is very versatile; AF is fast, and the built-in teleconverter is handy. The main cons are its weight - it is similar to the big 600 f/4 - and the f/4 aperture. In very low light a 300 f/2.8 or 400 f/2.8 have an advantage, even tough with recent cameras as the 1DX you have such great ISO capabilities that you can compensate a bit for the one stop difference. 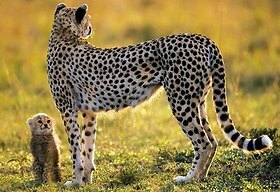 Even though personally I am a big fan of the 300 f/2.8, I can see two potential customers for this lens: sport photographers and the nature photographer that shoots mainly from hides or car, as in safaris. In these cases the weight of this lens is not a problem, since you don't have to carry it around, and the versatility of the 200-560mm zoom range is a great plus. Update May 14, 2013: Canon has announced that the 200-400 will be available from May 2013 at about 11800 $. I'll try to test the production version soon and I'll add here the image samples! Do you want to tell your opinion, ask questions to the author, or simply congratulate on a particularly interesting article? You can join the discussion by joining JuzaPhoto, it is easy and free! 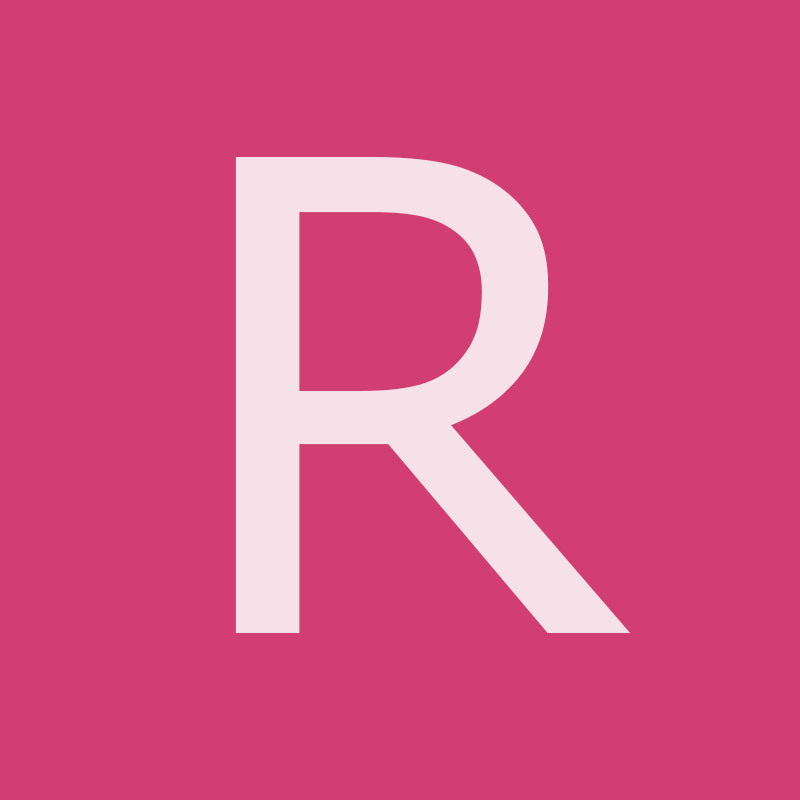 There is more: by registering you can create your personal page, publish photos, receive comments, join discussions and you can use all the features of JuzaPhoto. With more than 171000 members, there is space for everyone, from the beginner to the professional. It would be funny if Nikon would introduce new version of their 200-400 f/4 before this Canon ships. Personally I think it's utterly unprofessional to announce a lens that is not ready, heck it's gonna be 3 (THREE) years since the announcement. I hope for Canon boys that it will be worth the waiting. Canon has announced that the 200-400 will be available from May 2013 (much earlier than what I was told ) at about 11800 $. I'll try to test the production version soon and I'll add here the image samples!